OCT. 10, 2017 - Less than a week before the NBA regular season tips off, the league and its teams will celebrate youth basketball with the third-annual Jr. NBA Week, Oct. 9-16. Jr. NBA Week includes national and local events designed to build awareness and excitement for the Jr. NBA and team youth basketball initiatives. Jr. Pacers Night October 10 To help tip off the preseason, the Pacers play host to Jr. Pacers Night on Oct. 10 when the Pacers face Maccabi Haifa at Bankers Life Fieldhouse. Activation includes: Indy Parks Youth Basketball Teams play a game on center court during Court of Dreams; Representatives from the Jr. Pacers and TNBA will be on hand to provide information on how to become involved in camps & clinics; Special Olympics Team Indiana coaches serve as Honorary Scorers; representatives from Yorktown Youth Basketball will be honored during halftime presentation, and Special Olympics athletes will participate in the Kroger High Five Club, Peyton Manning Children's Hospital at St. Vincent Teddy Bear Exchange and halftime entertainment! Jr. Pacers Training Camp October 11 The Jr. Pacers Training Camp goes on the road to Concord Neighborhood Center, leading youth through a variety of training camp-style activities. Led by Pacers legend Darnell "Dr. Dunk" Hillman, youth will be instructed on the importance of staying active and participate in agility drills, dribbling, ladders, hurdles, core work and stretching. Jr. Pacers Coaches Clinic October 12 Led by Pacers coach Nate McMillan and the entire Pacers coaching staff, 200 youth coaches will participate in a Coaches Clinic, which provides instruction on offense, defense, practice, and teamwork. In addition, prior to the clinic, coaches will be treated to Food & Beverage compliments of Papa John's! Each coach also will receive a variety of Pacers goodies -- including a Jr. Pacers T-shirt, Jr. Pacers Clipboard, Jr. NBA Practice Curriculum, and tickets to the Pacers Home Opener! Jr. Pacers Clinic October 16 Pacers legend Darnell "Dr. Dunk" Hillman and Pacers guard Joe Young will play host to 100 Special Olympic athletes for a Jr. Pacers Clinic at Bankers Life Fieldhouse. 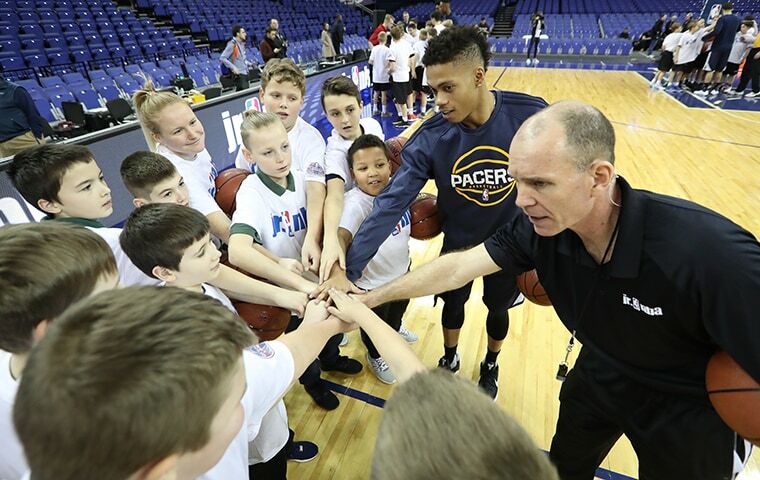 Jr. Pacers Clinics are open to boys & girls, ages 6-14 years of age, with a goal of not only providing skill and instruction in the game of basketball, but also discipline, character and sportsmanship. The Jr. Pacers clinics hope to help develop our youth into skilled players, responsible adults and of course avid Pacers fans.